More on Star Parties here. Mingo 2018 Brochure coming soon. Special Hotel Rates have been negotiated for 2018 Mingo Star Party Dates. See Document here. Wagman 2018 Brochure coming soon. Observatory Star Parties resume in April 2018. In the meantime follow AAAP Facebook and the AAAP Calendar for announcements of star gazing events scheduled at parks, libraries or other locations. Enjoy free fascinating and informative, cutting edge lectures in association with our monthly meetings held 7:30 PM on the 2nd Friday,* January through May and September through November held at the Carnegie Science Center. *Note the January 2018 Meeting will be on Friday, January 5, 2018. 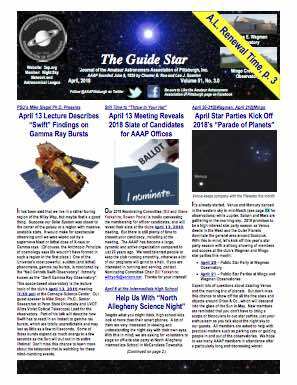 Actually, the January 5, 2018 AAAP Monthly Meeting in addition to the 7:30 PM lecture, includes a 6:30 – 7:30 PM Meet and Greet with Star Gazing at the Carnegie Science Center’s Rooftop Observatory.